Gold Manzanita Chaparral Branches, 18"-24"
Manzanita in modern metallic gold with a gloss finish. A perfect choice for use with crystals, weddings and anniversaries. 18"-24". Chaparral Manzanita branches are more slender, elegant branches, carefully selected for centerpiece use. Minimum order of 2 pieces. 24" is the overall height. Width will vary. Product photo is an example only. Branch size is a minimum of 24". May be slightly larger depending on the harvest and time of year, and may require trimming. Width is typically in the 8" to 9" range. We strongly urge you to read the Manzanita Buyer's Guide before purchasing manzanita branches. Every Manzanita branch is unique. The Manzanita photo for this product is a random example and is not the actual piece shipped. When purchasing natural branches such as Manzanita, Curly Willow and Birch, keep in mind that they are unlike other decorative branches used for floral design. Each one is an individual shape and sculpture, and may take on a variety of shapes and variations. Most professional centerpieces are created using several branches to achieve a full look, so always consider purchasing additional pieces or fillers. This needs to be a first consideration when purchasing your branches. It's best to order your branches all at once. If you place an order today, and another order in a week, you will nearly always see a difference in the product. This is because the harvest areas change every 2-4 days, resulting in changes in the harvested product. No two harvests are ever the same. 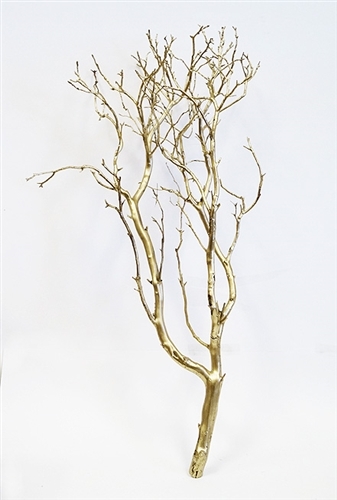 Adapting Manzanita for Non-Centerpiece Use: Our branches are harvested specifically for centerpiece use, and our suppliers are instructed to harvest the most symmetrical pieces available. They are generally not suitable for hanging on a wall, or placing flat against a vertical surface. Symmetrical pieces must be CUT OR TRIMMED for other specific uses. We DO NOT GUARANTEE that any cutting or trimming techniques will adapt your branches for the intended use. The following characteristics of manzanita branches are naturally occurring, and are a part of working with the material. Shape: shapes vary with each piece, harvest area, and time of year. Manzanita always grows wide and flat rather than symmetrically. Branches: branches can vary greatly in diameter with each piece. Size: sizes are approximate and vary with each piece, harvest area, and time of year. Bark: color and condition of the bark will vary with each season, harvest area and time of year. Spring through Summer (six month period), Manzanita bark will regenerate and peeling will take place. To remove loose or peeling bark, use a soft brush. For stubborn areas, use a light wire brush. Touch up with floral paint, such as Design Master's "October Brown" floral paint available at Michael's Crafts. 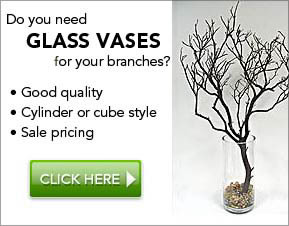 Age: Manzanita branches will last indefinitely (we have centerpieces in our showroom that are several years old). Cracks and splits will occur as the wood naturally cures, however this will not cause them to break in half, fall apart, etc. Using the floral paint mentioned above to add color into the spliting areas makes them practically non-noticeable. Leaves: leaves are mechanically or manually removed, depending on the current season, harvest or time of year. Perfect for our event, and easy to snip and manipulate. The customer service is by far one of the best. They were attentive and addressed any issue I had. The product is great as well and shipped very fast.